Rock Band Camp Now Open for Summer 2017! January 5, 2017 / Richards Guitar Studio / Comments Off on Rock Band Camp Now Open for Summer 2017! You can now enroll for Summer 2017 Rock Band Camp! All of the information is on the Rock Band Summer Camp page. Serving Delaware County and the Tri-State area. Rock Band Summer Camp with Richards Guitar Studio and Richards Rock Academy is held at ValleyPoint Church in Glen Mills, PA. The facility has a stage, state of the art PA system, offices for private lessons, and a kitchen / lounge area. Students learn songs, technique, instrument repair, songwriting, improvising, audio equipment setup and use, and much more. Last year’s camp was a big success, and the result was a concert performance by the student band “City Witch” of Running Down A Dream by Tom Petty, Buddy Holly by Weezer, I Love Rock and Roll by Joan Jett, an original song by the band, and a killer blues jam! For full information, go to the camp page here. Nate from Richards Guitar Studio and Richards Rock Academy shows you a great alternate picking exercise on guitar that helps increase speed, endurance, and synchronization between the picking and frethand fingers. When practicing an alternate picking exercise on guitar, you want to start slowly, playing evenly and controlled, and only begin increasing speed once you have committed the exercise to muscle memory / reflex in the hands. Use a metronome to systematically increase speed gradually over time. When practicing this alternate picking exercise with a metronome, play eighth notes (2 notes per beat, “1 + 2 + 3 + 4 +” using down-updown-up etc picking). Why do drills such as these? Don’t they seem like a waste of time? On an almost daily basis, I see YouTube videos of great guitarists sharing their warm-up drills and exercises, scales, arpeggios, stretches, etc. Recently, off the top of my head, some of those artists include Alexi Laiho, Jeff Loomis, John Petrucci, Joe Satriani, and Steve Vai. I’m constantly on YouTube for my lessons so I get to see many of these videos pop up in my recommendations. If warm-ups, drills, exercises, etc are worth the time of such great guitarists, than they are certainly worth our time and attention. Practice with a metronome. Jeff Loomis recommends it, so….yeah….do it. Be patient. Speed takes time. I’m currently trying to increase my tremolo picking speed, and I’m telling you it is frustrating sometimes. I know what I want to do, I know the goals and techniques I’m striving to perfect, but my hands simply won’t do it – yet. I know I’ll get there, and although it isn’t happening right away I know I’ll wake up one day and BOOM my tremolo picking will be faster than ever. It’s sort of like diet and exercise – you do it and your body will respond. It’s inevitable. Stop practicing the exercise, then revisit. Once you’ve gone as far as you can and hit a wall, move to doing other exercises for a month or two, then come back to this one. You’ll find that doing a 2nd time around can actually push your speed farther. Don’t expect to get all the way to 100% in the first season of practice. It takes revisiting. Richards Guitar Studio and Richards Rock Academy offers professional guitar lessons, bass lessons, drum lessons, guitar teacher training, and rock band rock school in Aston, PA. Serving Ridley Park Swarthmore, Garnet Valley, Wallingford, and Delaware County, PA.
Nate shows you the first of 5 scale patterns that are essential to you guitar development – the CAGED Guitar Scale Pattern 1. The CAGED System is an ordering of bar chords and scales that help you learn how to play chords and scales in any position on the fretboard that you want. It is a fretboard mapping system, and it makes guitar soloing and improvising in all keys much easier and more manageable. At some point, we will discuss the overarching concept of the CAGED System. However, your first goal is to simply learn, memorize, drill, and improvise using the scale patterns in order to get the scales under your fingers. Memorize the open position scale AND the octave position scale right from the beginning. the octave position scale is the one you’ll use the most, as it is movable to any key. The open position scale is locked to the key of C Major, so you’ll only be able to use that one when in modes related to C Major. Practice with strict alternate picking, in addition to economy picking. Start with strict “down-up” picking, no matter what string you are one, no matter what pick you’re on when you change strings, etc. Always a down followed by an up. Then, try economy picking. This is where you change strings from low to high using downstrokes, and from high to low using upstrokes. The effect is that you’ll be picking in the direction that you are changing strings. BOTH picking strategies have merit, although the alternate picking route is the best if you play any genre of rock or metal. For jazz and fusion styles, economy picking is best. Stay tuned for a lesson on how to practice scales on our blog coming up right after Drill #48. That lesson will offer plenty of advice on how to practice scales once you memorize them, and get the most technique development out of the CAGED guitar scale you are currently working on. 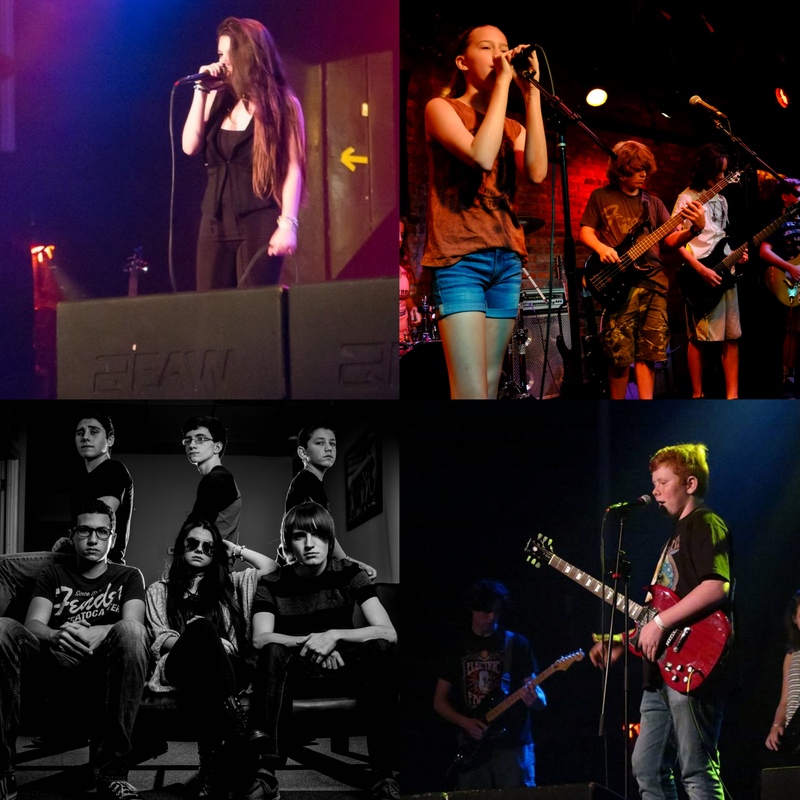 Richards Guitar Studio and Richards Rock Academy offer professional guitar lessons, bass lessons, drum lessons, and rock band school in Aston, PA. Serving Ridley Park, Swarthmore, Garnet Valley, Media, and surrounding Delaware County, PA.
Richards Rock Fest – Spectacular! September 22, 2015 / Richards Guitar Studio / Comments Off on Richards Rock Fest – Spectacular! On Friday, September 18, Richards Rock Academy bands played a 3-hour rocking show at Richards Rock Fest at the IBEW Austin Room in Boothwyn. A beautiful banquet hall setting, perfect sound provided by Bruce Gill, delicious catering and open bar, and 6 RRA bands made for a night we all will remember! This was the first show for our new pop band, The Fridays, and they performed an excellent set! 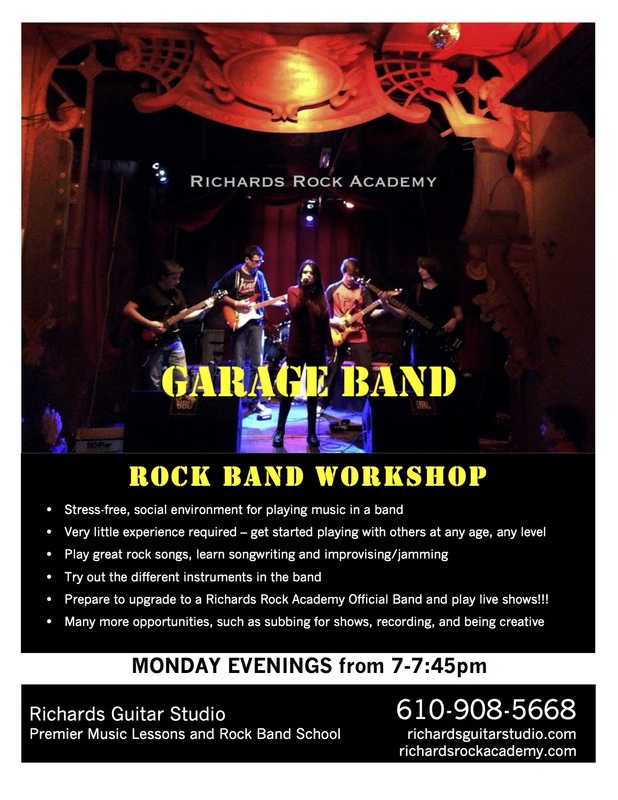 Richards Rock Academy is the rock band school program at Richards Guitar Studio in Aston, PA.